Cool temperatures have arrived, which means holidays, decorations, rainfall, new bedding plants, and assorted greens in the garden. Cool season vegetables are easy to grow as long as you provide them with full sun, good drainage, and high fertility. Among the easiest of all are turnip and mustard greens. I fully realize that I’m identifying myself as a true Southerner; but I grew up in East Texas eating turnip greens and cornbread and assumed everybody else did as well. Heck, I thought East Texas was the only place on the planet that had pine trees, dogwoods, azaleas, camellias, and gardenias. Dallas, Austin, and San Antonio didn’t. It wasn’t until I took a trip to Six Flags Over Georgia with the Longview High School band that I realized that my beloved East Texas was just the western edge of a large similar region. It turned out that the folks in North Louisiana, Mississippi, Alabama, and Georgia talked like me, gardened like me, and ate like me. I wasn’t alone after all. My next greens epiphany came when I took a job at Alston’s Nursery in Port Arthur in 1987. Everybody there ate mustard greens, not turnip greens. What the heck? We even sold mustard green transplants, unheard of at the time. One farmer purchased most of them. I still hadn’t figured greens in the South out until I went to school and work at LSU. South Louisiana folks (where many of the Port Arthur residents came from) exclusively ate mustard greens as well. Then it finally clicked. People from Northeast Texas and North Louisiana ate turnip greens, while people from Southeast Texas and South Louisiana ate mustard greens. And African Americans throughout both areas ate collard greens. By the way, collards are botanically the same as kale (without the frills) and are the most nutritious vegetable of all. All garden greens are good for you, and if you don’t like them you’d be wise to figure out a way to prepare them so you do. If you can’t stomach a big pot of “slimy” greens and potlikker over cornbread, then maybe you’ll eat baby greens in your salad. Or perhaps you’ll use a tender young mustard leaf on your sandwich like I do, as a substitute for yellow mustard and lettuce. And there are always kale chips. But if you insist on being a greens snob, maybe spinach or Swiss chard will turn you on. 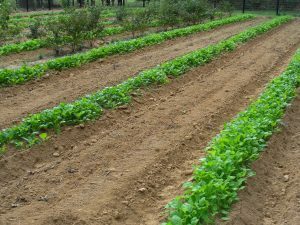 In addition to planting large areas of turnip and mustard greens each year for an edible cover crop, I always plant a raised bed or container full of spinach too, so I can have baby spinach salads. November was a busy month, both professionally and horticulturally. The first Saturday of the month had me speaking in Conroe on “Landscape Design” and then at the Antique Rose Emporium that afternoon on “The Rose Rustlers,” the topic of my next book. The Rose Emporium was beautiful and interesting as always. 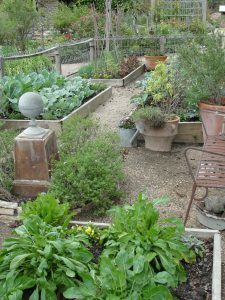 I especially enjoyed the little potager featuring even more cool-season greens. After I finish up all my pre-scheduled talks, my new job with Texas A&M AgriLife Extension will keep me off the road and focusing on my own Smith County Master Gardeners, Tyler area home gardeners, and the Smith County horticulture industry. We’ll be training a new class of Smith County Master Gardeners starting in January. They are faithful about working in the demonstration gardens at the Tyler Rose Garden every Tuesday morning. I enjoy running around with the noisy blower, irritating them as I can’t stand messy sidewalks and paths. If you’ve never visited the Tyler Rose Garden, you should. It’s free and we offer full refunds! 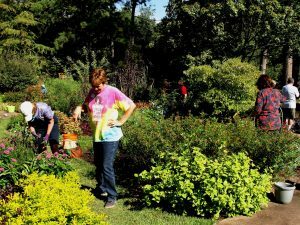 The Smith County Master Gardeners plant and maintain the Heritage Rose Garden, the Sunshine Garden, the Shade Garden, and the IDEA Garden there. Thanks to friend Keith Hansen and company, I’ve inherited a great bunch of Master Gardeners and some cool gardens. My new job had me training for a week at Horseshoe Bay the second week of November, just outside of Marble Falls. Horseshoe Bay has an incredibly well maintained landscape. I’ve never seen so many palms before. The drive over was long but I always enjoy the beautiful scenery in the Texas Hill Country. Then our final East Texas Garden Lecture Series at the Tyler Rose Garden featured the ever enthusiastic Dr. Jared Barnes from Stephen F. Austin State University on “Foodscaping with Incredible Edibles.” Like Jared, I was born to graze through the landscape. 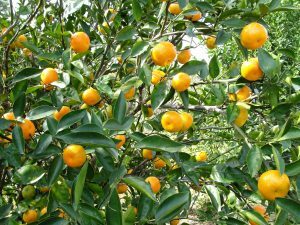 In addition to a bevy of greens in my garden, one of my ‘Arctic Frost’ mandarin seedlings produced a bumper crop just up the road in my parent’s garden. Every person my mom knows has enjoyed a sack of fresh “oranges.” I’m even juicing them. The plant is very thorny which is good in my opinion because it keeps greedy folks from picking them all! Speaking of greedy, all hasn’t been pleasant in horticulture heaven. Some unethical rosarian sneaked into my country garden past posted signs and wire cages and took all the cuttings off my newest once blooming rambler that I ordered from Oregon this year. Unfortunately I’ll now have to wait more than a year to see it bloom, assuming they don’t come back and steal the entire plant! I watched every inch the plant grew and was horrified and angry when I saw it cut back to nubs with a pair of pruners. It’s hard to fathom, but theft from my garden has long been a problem. It’s the price I pay for living a public life. 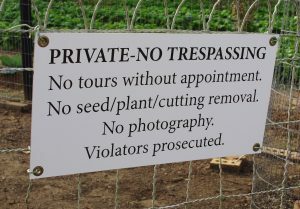 It’s sad that I now have to garden with game cameras, locked gates, and instructions for my nearby relatives and neighbors to press charges against trespassers. Also the large pawpaw at my parent’s that I watched zebra swallowtails raise on got “accidentally” cut to the ground with a chain saw (for the second time!). My dad gets very confused when my mom gives him occasional garden chores. I assured her that it would sprout back and she assured me that he was never allowed to cut ANYTHING again.